Chinese martial arts history and methods (including Wing Chun) were transmitted almost exclusively through oral means. This has several explanations, the first and most important being, that the masters of a style were not interested in popularizing their personal techniques. There were many life and death situations so why would they let everybody know anything about their fighting methods. Therefore, the data that we have today is more based on the oral tradition of different groups of practitioners and less on historical accuracy. Another factor to be considered is that often, history was mystified intentionally, either to conceal information and to disguise different people, or, on the contrary, to create an image of a style with a warrior tradition at a higher level than others. Let’s call it marketing and branding. In light of the latest historical discoveries, and in accordance with the information that we have , what we know as the “Wing Chun Kung Fu” is a style created around 1700 under Emperor Kangxi (1662-1722). That was a period of intense social unrest. Buddhist Temples (enjoying some freedom) were offering a safe heaven to anybody fleeing persecution. The Shaolin temple, the place Wing Chun originally traces its roots, is a relatively generic name, many monasteries borrowing this name (and with it of course the reputation) from the original monastery in Henan Province. The legend states that after the destruction of the temple by the Ching imperial troops, one of the survivors, known as the nun Ng Mui, ran away in hiding, further refining the fighting methods practiced in the temple. We actually do not know if she really existed of if she was indeed a female after all. Due to complete lack of written documents from that period we should take the legend with a grain of salt. Furthermore, Ng Mui’s method reached a young girl, Yim Wing Chun, from which the system took it’s the name. This entire episode might be as well be just a legend created to give more credibility to the system and to provide a, let’s say, romantic approach. Marketing wise it was a good thing because at least in modern days, many female students were attracted to the practice by this legend. 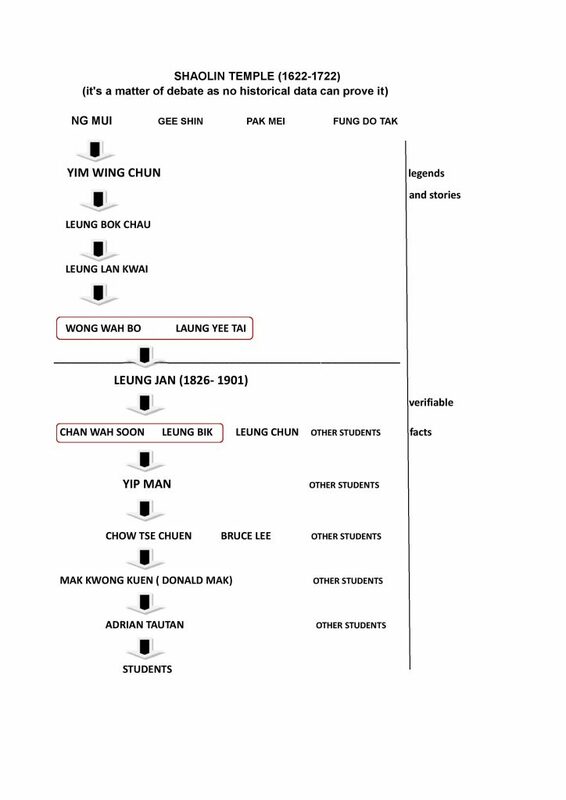 According to this story, Yim Wing Chun was the daughter of a toufu(soy bean cheese) merchant from whom Ng Mui used to buy food. One day, Ng Mui saw Yim Wing Chun being very sad, the reason being of course love. Yim Wing Chun loved and wanted to marry a young guy named Leung Bok Chao. Bad luck however, because at the same time, one of strong and influential local person(some call him a gangster) wanted to marry her as well. Following Ng Mui’s advice, Yim Wing Chun challenged the strongman to a fight, the prize being obviously her hand. After one year of intensive martial art training she managed to win the fight and married her true love, Leung Bok Chao, as a result. Knowing the Chinese culture, I would personally assume that this episode is a pure invention. It would have been more credible if Leung Bok Chao had fought the strongman himself to win the hand of the girl. In a society where the feelings of love and the free will of daughters were totally suppressed by the families, this legend sounds more like wishful thinking. The main point underlined however by this story, is that a physically weak opponent can beat a stronger person as a result of intense martial art training. True or not the legend emphasizes on this idea quite a lot. Legend also tells us that Yim Wing Chun taught her fighting method to her husband who in turn taught Leung Lan Kwai who passed the style to the Chinese Opera actors, Wong Wah Bo and Leung Yee Tai. The person who made actually Wing Chun what it is today is Leung Jan a direct student of the 2 actors. Leung Jan, is the first person we can find historical data about. He was a real person, a physician and pharmacist who lived in the city Fatshan between 1826-1901( the exact dates are matter of debate). Leung Jan is the initiator of several Wing chun currents. Thus, during 1860-1890 he taught a fairly complex system to his sons (Leung Bik, Leung Cheun, Suen Leung, Leung Jee, Leung Yuen, Leung Ko) and a to a neighbor – Chan Wa Shun. Towards the end of his life, he taught a more simplified and conceptual system (but not necessarily less efficient) to Sam Wa Wong, Yik Ying Dai Mui Mui and Sai. 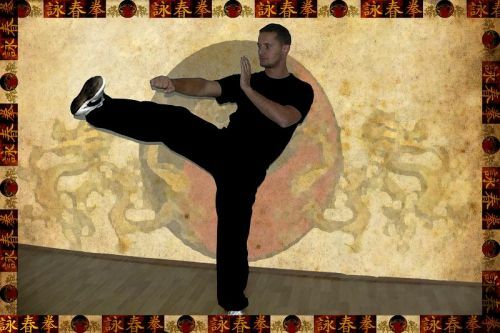 The method is today known as Gulao (Pien Sun) Wing Chun. Chan Wah Shun will become one of the students to carry on the name, techniques and Leung Jan’s school. He was a pretty low status person considering the Chinese tradition, ( exchanging money was his job) and possibly had ties to other side of the law. This, undoubtedly put him often in combat situations. Being very strong physically and practicing a particularly aggressive version of Wing Chun, Chan Wah Shun remained undefeated in all these confrontations, becoming a local celebrity. Towards the end of his life he retired and start teaching Wing Chun to a number of carefully selected students. Among these, there was one is the one that will radically change the history of Wing Chun and who will change the status of this obscure fighting style practiced only by a handful of people in villages in southern China. Because of this man, Wing Chun will became one of the most famous kung fu styles. The name of this man was Yip Man whose life was a subject of many movies already. Our lineage continues with Chow Tze Chuen a long time student of Yip man who then taught SiFu Donald Mak.